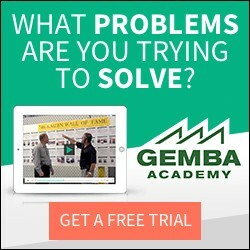 Like many companies, we make a lot of improvements each month at Gemba. We don’t always think to write them down or celebrate them. We will “kaizen the kaizen” by writing them down in an effort to be more mindful about the wonderful kaizen ideas that we all have and implement. In order to celebrate these and stimulate more ideas we will document and post the “kaizen of the month at Gemba” from now on this blog. This first one is a great office kaizen example, courtesy of Marcie our Office Manager. Every Office Manager dreads processing Expense reports and I am no exception. Keeping track of consultants who may be in Mukilteo one day and Mumbai the next is tough enough. Keeping track of their expenses just makes it more challenging. So I made it a goal to try to knock as much waste out of this process as possible. Now my expense reporting is a lot more user friendly for both players – me and the consultants. 1. Consultants would collect all of their receipts while on a trip. Upon arrival back at the office they would take these receipts and put them into a detailed expense report. This could take them anywhere from 15 minutes to a half an hour (more if a receipt was misplaced). They would then give it to me to review. 2. Go through all the receipts and make sure that they are listed on the expense sheet properly. This step is needed because some consultants are better than others about keeping receipts (5-10 minutes). 3. Double check the expense report heading to make sure it was filled out correctly (3-5 minutes). 4. Enter in all of the credit card charges (5-10 minutes). 5. Create a check for the reimbursable charges (3-5 minutes). 6. Create an invoice – list the amount charged for expenses (3-5 minutes). 7. Tape the receipts onto blank pieces of paper (5 Minutes). 8. Copy or scan in those receipts to attach to the invoice and mail (3 minutes). 9. Obtain approval on the expense report and file expense report (2 minutes). On a good day this process took me 25 – 45 minutes hands-on time. Some days, especially if I had to return it to the consultant to correct, it could take me up to a week to complete. The TOTAL LEAD TIME: 40 minutes to a week. This had some serious drawbacks, employees would not be reimbursed in a timely manner, invoices were not created in a timely manner and my inbox got really full. 1. The consultants obtain an envelope before they go on their trip. They put all their receipts in there; they fill out the header on the envelope. This takes them about 5 minutes total. 2. I scan the receipts into my NeatReceipts, this calculates the totals of the receipts, I can create an expense report for the invoice, an import file of credit card charges for my QuickBooks and a reimbursable amount for my consultant (5-10 minutes). 3. Create an import file and download credit card charges into QuickBooks (30 seconds). 4. Create a reimbursable expense report and write a check for employee. Attach report to envelope and close with receipts (1-2 minutes). 5. Create the invoice, attach the NeatReceipts report to that, this has a copy of the receipts, mail or e-mail (1-2 minutes). 6. Obtain Approval and file expense report (1-2 minutes). Total hands-on time: 14-20 minutes!! TOTAL NEW LEAD TIME: 14-20 minutes!! Best of all, the consultants now have one place to put all receipts – in the envelope. A note to all who read this, if it is a process, it can be mapped and the lead time can be calculated. Some consider lead time to be one of the most important metrics of a process. Look for muda, mura, and muri wihtin the process, reducing these in turn will reduce lead time. In my little mind, I have always considered lead time to be a measure of muda, mura, and muri. Then it’s like golf, a lower score (lead time) is better. PS. I may have to replicate this wonderful idea myself. PSS. Lead time is a lot like a golf score. It can never be zero, and therefore, can never be perfect. But like golf, you always go back out there and try to make it better. I think this article does more to explain what Kaizen and lean manufacturing is than any other theory article. Please keep writing up more examples and case studies. Well done on both the process improvement case study example and the sharing of it on this blog. As mentioned by John seeing (you cleverly provided photos to help visualise what you did) an actual improvement case study brings kaizen to life and is a more clear way to understand how to do Kaizen than just knowing the theory. Please let us see more of your Kaizen case studies I’m going to pass this one on to our admin support people as a good example of how to make improvements, how to share the expereince and promote horizontal deployment. Hi Marcie, why not give the consultants a company credit card ? If you make sure all consultants know what may and may not be charged to this card you have Kaizened your way to no time at all. Only thing you need to do is check the creditcard withdrawals and take back (pay check) what wasn’t allowed to charge. A big plus is that the consultants don’t have to pay company expenses in advance. I am so glad to hear that sharing my kaizen is helping you. As far as the credit card question, all of our employees have a company credit card, they still must turn in their receipts for billing of the client and entering into the accounting system. Of course we need to be able to turn those receipts over to the government as well if audited. The nice thing about NeatReceipts is that it holds an electronic copy of the receipts, which the IRS will be accepting. I can get rid of paper waste as well. Its fantastic to read through !Appreciate your efforts to share it with the community. I have a quick question, when you scan the receipts , wouldn’t you again need to enter the total in a spread sheet or some place as I guess scanner could copy and store data in system but could not pick up the total bill figure ;As different bills will be of different formats. Looking forward to your response on this !